Yamaha Motor Corp., USA’s 2017 youth ATVs are at dealerships now for the holiday season. These models include the all-new YFZ50 for budding ATV enthusiasts ages 6-years-old and up, and new 2017 Raptor 90 for ages 10 and up. 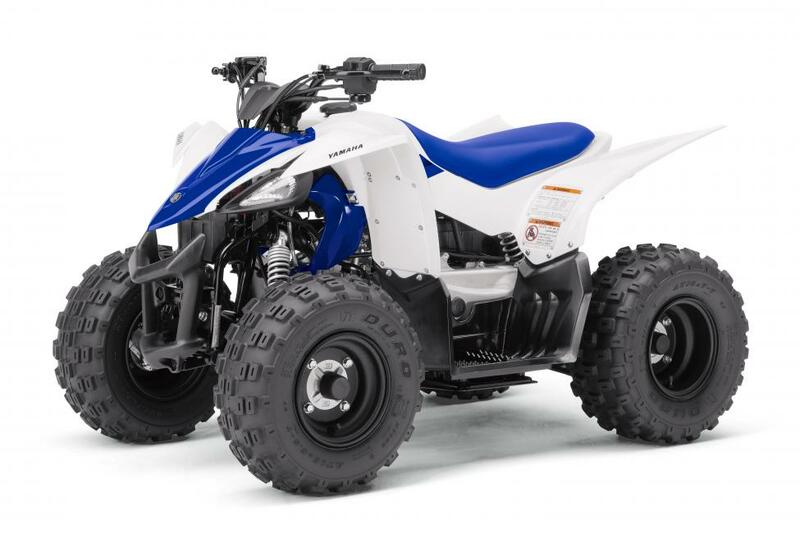 With sporty designs inspired by their larger brethren, the championship-winning YFZ450R and best-selling Raptor 700R, Yamaha’s youth ATVs bring Yamaha performance and quality to more families and the next generation of motorsports enthusiasts for the holidays. The YFZ50’s low-maintenance 49.4cc engine with automatic continuously variable transmission (CVT) delivers entry-level performance and a confidence-inspiring ride for those aged 6-years and up. For new riders developing their skills, the YFZ50 is designed with parental control features including adjustable RPM and throttle limiters, as well as a tether switch capable of shutting off the engine from a pull-string, if needed. 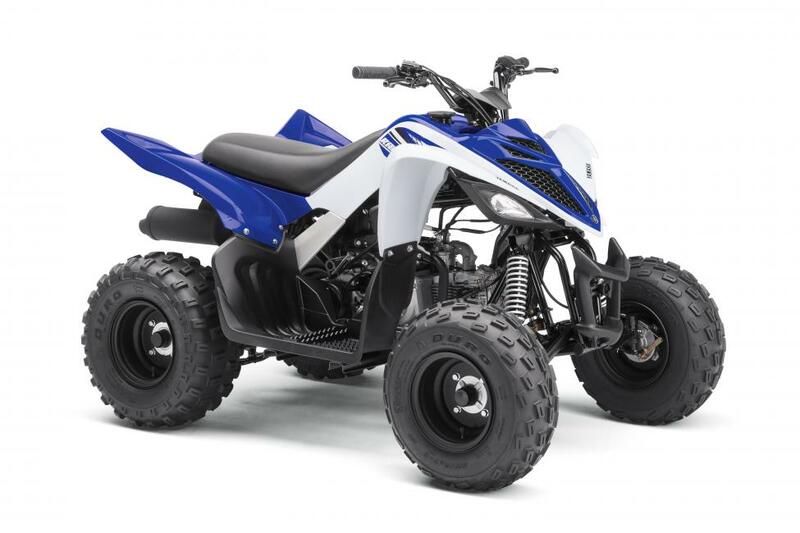 Built to Yamaha quality and reliability standards, parents will know their growing riders are learning aboard best-in-class ATVs. For riders 10 and up, the Yamaha Raptor 90 is also equipped with a CVT transmission, yet steps up the power with an 89.9cc engine providing versatility on the trails while maintaining a smooth and comfortable operation. The Raptor 90 adopts additional features to augment performance including single A-arm front suspension, mono-shock swingarm rear suspension, 18-inch tires with lightweight matte black wheels, as well as a wider seat and floorboards allowing room to grow. The all-new 2017 YFZ50 is available in Team Yamaha Blue and White starting at a $2,099 MSRP. The 2017 Raptor 90 comes in two color options: Team Yamaha Blue and White, and White, both with a $2,899 MSRP. Follow Yamaha online at www.facebook.com/yamahamotorusa, www.twitter.com/yamahamotorusa, and www.instagram.com/yamahamotorusa/. Yamaha Motor Corporation, USA, (YMUS) a leader in the motorsports market, makes the toughest, most capable and versatile ATV and Side-by-Side vehicles. The company’s ever-expanding product offerings also include motorcycles, outboard motors, personal watercraft, snowmobiles, boats, outdoor power equipment, accessories, apparel and much more. YMUS products are sold through a nationwide network of dealers in the United States. Headquartered in Cypress, Calif., since its incorporation in 1976, Yamaha also has facilities in Wisconsin and Georgia, as well as factory operations in Tennessee and Georgia. For more information on Yamaha, visit www.yamahamotorsports.com. ©1999 - 2019 ATVPG, LLC. All Rights Reserved.